I seem to be in the reading sequels to my favorite books of last year mode. For the record--a freaking awesome mode to be in. Graceling was one of my very favorite reads of 2008 and the year's best YA I would venture to say. And before you get all up in arms, let me assure you I enjoyed The Hunger Games as much as the next person. But Graceling was just the one, you know? And I have this feeling that Kristin Cashore is something special. I was positively thrumming with anticipation when I heard she had a second book to follow. And it's the one I chose to take home with me on the plane ride home from BEA. Fire is, in point of fact, a prequel to Graceling and takes place 30 years or so prior to Katsa and Poe's story. It is also set in an entirely different land, though definitely in the same world, and (as I am sure you have already heard) a certain terrifyingly familiar character from Graceling makes an appearance in Fire. Otherwise, it is its own story and it stands completely on its own feet. Fire is a monster. A human monster. And the last of her kind. In her homeland, the Dells, there are all manner of monsters from lizards and mosquitoes to leopards and raptors. But they all have one thing in common--their incomparable beauty. These creatures come in a gorgeous riot of color and texture and are so beautiful they literally impede rational thought in the humans they come into contact with. With the ability to control the minds of those around them, they inspire an uncomfortable (at times deadly) mixture of fear, hatred, and absolute longing in the people of the Dells. And no one is more hated or sought after than Fire. Her father was King Nax's most trusted advisor and closest friend. He was also the one responsible for the king's untimely death and for the current chaotic state of the realm. When Fire's service is requested on behalf of the young King Nash and his brother and war commander Brigan, Fire is thrust out of her quiet life and into a mounting war. Forced to reconcile her questionable abilites with her own demanding conscience, she is immediately caught between right and wrong, a dark past and uncertain present, and a pair of brothers determined to win at all costs. This book made short work of me. There was just so much hope inside me wrapped around how good it would be and when it turned out to be approximately ten times better than all that wrapped up hope....well....I was a goner. I looked forward all day long to the moment I could crawl back in bed and read more about the Dells and Fire and Brigan and Archer. And the list goes on. These characters are breathtakingly real and the way the gorgeous, understated writing tugs and pulls and builds a complex and lovely world around them makes the whole package irresistable. Best of all, Fire herself struck a chord deep within me and I held my breath as I watched her move through her world, worried she wouldn't meet with enough care, hoping someone in the messy throng of plotting, planning, warring kings and soldiers would recognize her for what she was. Like Katsa before her, she is so very strong, an outcast her entire life, and yet she never turns her back on those who need her. Even when they have no idea how desperately they do. Even when she herself is afraid. Fire is, wait for it, even better than its predecessor. It's subtle and thoughtful and throbbing with genuine emotion--three qualities I often find lacking in my reading. It is, without a doubt, the most difficult of combinations to achieve, but when the right note is struck....magic. Fire is due to hit shelves October 5th. So..Hmm. I should read Graceling first right? I'm really waffling on it! eee, the review makes me want to read. 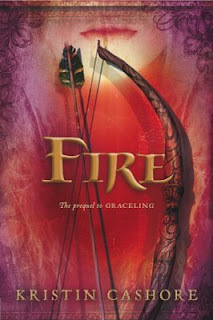 I loved Graceling as well and can't wait to get a hold of Fire! Glad to know you liked the book as well! Emily, I was blown away by how good it was. You will not be disappointed. I love-love-loved Graceling and now after that review I just can't wait! Here's to hoping October gets here, like....tomorrow, lol! I would read Graceling first. Fire has a huge spoiler. I also thought the worldbuilding was remarkably uneven. For instance, the whole first half of the book they spend on the run from this massive horde of monster birds who literally stalk and chase Fire wherever she goes. They have to close towns and cities that Fire passes through to protect people from them. And then.. they just vanish. She spends the rest of the book outside just fine without ever worrying about the massive attack birds. I thought the book got better at that point, though. I am still at a loss as to why it would be considered YA, though. Fire is nominally a teen, but the whole book is about "taking lovers" and "having children" and really adult fantasy political stuff. Graceling was barely YA. Fire isn't YA at all. Sounds like Kristin Cashore is becoming the author to watch. Need to read Graceling. Thanks for the review! Anon, thanks for your post. I'm sorry you didn't enjoy FIRE. Did you love GRACELING or was it also not your cuppa? I'm just wondering because I felt like most people who enjoyed GRACELING would enjoy FIRE but perhaps they are different enough heroines that that isn't the case. Interestingly enough, I felt the opposite as you about Fire herself. I thought she put up with so much crap gracefully. And that she herself was so unfocused on her own beauty, constantly avoiding mirrors, etc., that it wasn't even on her radar apart from trying to stay under cover. As that monster trait was built into the world itself, it did not bother me. I'm also interested in the issue of whether or not it is a YA novel. This is often a thorny topic and one I've given a lot of thought to. I believe it's a YA novel if the protagonist is a young adult. And young adults, of course, range quite a bit in age from 12 or so all the way up to early 20s. I also feel that young adults are often up against similar issues as Fire. Including if, how, and when to become sexually active, choosing whether or not and in which ways to be like their parents, longing to be part of something larger than oneself, and so much fear it is incapacitating at times. At the same time it is a fantasy novel, full of battles, magical creatures, true friendships, and sacrifice. All of which has high teen appeal, I think. In any event, it will be interesting to hear from more reviewers, adult and young adult alike, and see what kind of reception it gets. Thanks again for your response. I love a good discussion and diversity of opinions! Just so we don't risk spoiling any more of the story for readers, why don't we take this conversation to email if you'd like to continue. My contact link is in the sidebar. Donna, you're most welcome. I hope you get a chance to read GRACELING soon. It's lovely. Same anon as above. I loved Graceling. Also one of my favorite books of the year. Katsa was an amazing woman. I was dying to read Fire. And yeah, she avoided mirrors, because she was "tired of having her breath stolen by her own beauty whenever she caught sight of herself." Gag. I feel like the whole first half of the book could be cut without any loss to the story. Like I said, it got much better. It was like I was reading two different books, about two different women, set in two different worlds. One went around TSTL, whining about how she was just so beautiful it wrecked her life, whine whine whine, oh, the evil birds, oh, I don't care if everyone around me is put to death by me wanting to walk outside at night! And the other was a powerful, self-aware woman whose life had been destroyed by her own beauty but she was going to take responsibility and act with grace and compassion. If that was all the Fire I'd read, that would be the Fire I liked. Hey Anon, well there you go. It sounds like Katsa and Fire are different enough that some GRACELING fans may not gravitate as much to FIRE. The thing about cutting the first half is that I would really miss all the backstory, much of it necessary to understand character motivation. Trying to avoid spoilers here or I'd go into more detail. But suffice it to say I liked the history of the Dells, Fire's family, and friends. I sympathized quite a bit with Fire, not with her overpowering beauty, but with how much of an outsider it made her. No beauty is worth the way it made people try to use her. And she knew it. Sounds awful to me. The thing is, I loved how she changed and grew. There has to be room in for character development and growth, don't you think? If she was a perfect, kick-a** 17-year-old from the get-go she'd make me nervous and I wouldn't have cared for her nearly as much. Perhaps that says more about me than her, but I do tend to respond to flawed characters who have things to learn and who become stronger over time. I think if we saw her "change and grow" that would be something different. Or if we'd seen a character who said "oh, I used to be shallow and self-absorbed but now I'm trying to put that behind me and grow" -- which I also love. What I saw in the first half was a character who would never have done the things that the character in the second half reveals she's done. We see a character in the second half of the book who never seems to recognize her horrible, horrible behavior in the first half. They are two different people completely, with two completely different issues to get over. Without being spoilery, do you think the Fire who did what she did would be so cavalier about letting her guards/companions/random villagers die so she can go walking at night? I don't. Especially not as many times as she did it! What it feels like to me is that Cashore started out trying to write a particular Fire, then ditched that to write a very different, much more Katsa-like Fire and never went back and reconciled the two. If you go and read books about horrible people getting over themselves (say, SOMETHING BLUE by Emily Giffin) you usually SEE them grow and change, or recognize their former selves once they become better people. I didn't see that in Fire. I would have liked seeing the young Fire that was spoken of in the second half of the book actually existing on the page in the first half of the book. Instead, I got the equivalent of a fantasy-world Heidi Montag. lovely review Angie. I am indeed jealous of your current read pile. Some definite keepers. I loved FIRE even more than GRACELING, too, which I didn't think was possible. I'm not sure I'd use the word cavalier to describe Fire. Yes, she does risk herself--and her guards--by going outside, but what's the alternative? That she never, ever, ever go outdoors? I can understand why that would be unbearable to her. It's a choice she makes just like all the others, and I think what we could call her solipsism IS something teens identify with. And she does y her own weapons, which she knows how to use; she takes what precautions she can. It's part of her struggle. I hesitate to call any character who has a flaw/attribute that they can't do anything about and struggle with whiny. It's easy to do with those characters who struggle with something like beauty, which society sees as such a positive. But is Fire disliking her beauty any different than Katsa disliking her Grace? I am so excited that you have Fire because now I can jump right into it after I finally read Graceling (which is next in my TBR pile). So many perks of living down the street from Angieville. Anon, it sounds like Fire rubbed you very much the wrong way. It's a very unpleasant feeling when a character (for whatever reason) starts to ring untrue. FWIW, I didn't feel as though Fire's behavior in the first half was horrible. It seems to me she'd spent her whole life trying to do the right thing. Like CuriousMartha, I felt she worked hard to keep the rules as much as possible. She only went out when she would have gone mad staying inside a second longer. Also, the guards were not her idea; she had not asked to have them risk their lives for her. And I think it was clear as the story went on that she came to care very much what happened to them. Like Katsa's, Fire's is a world full of violence and impossible choices and people are forced to make decisions they would never have to face in a less divisive world. Whether or not they made the right ones is, of course, up to the reader's interpretation. And we all read it differently. Michelle, thanks! Can't wait to see what you think of this one. Liza, lol. Just part of the service we provide here at the 'ville.